Back to the Future continuations? Some more rumors I heard were that Spielberg was planning on mixing MR with some other thing called AI also set in the future or completely nixing MR.. I have no idea where these rumors came from, but all I can say is they are not true. The actual man who is penning the script for Spielberg, whose name escapes me, said himself that the rumors are totally unfounded, & Spielberg is definitely making Minority Report. So we can all rest at ease with that one. Well, Spielberg was on the cover of LIFE this weekend with his dad. It was a whole article on him & his dad, & luckily for you, I got the magazine, & with my new scanner, scanned it for you to read it at your own disclosure. SO, click on the cover below to take a bigger look at the cover, & follow the links from there to read the article. Well, I go to a school somewhere in the United States, & sometime after the Littleton shooting, my school & students became paranoid. One student constantly came to class with a trenchcoat, & there were rumors that he was gonna blow up the school. Well, May 17th was the big day, I came to school anyways, & to my GREAT surprise (sarcasm), about half of the students didn't show up...So, that was cool. No bomb ever came. However, there were rumors that the bomber wanted to see Star Wars first so he would postpone the bombing til May 20th... yesterday. So, there I was sitting with first hour about to end, when the principal came on the speaker and told everyone to evacuate. We did, we were out there in the sun for about 30 minutes when we were called back to class finally. During these 30 minutes, kids hopped over fences to skip, then the adminstrators didn't want any kids to get hurt, & the cops didn't care so they opened the gates, & a flood of hundreds of students just left, & went home. Except me though, cause I live too far, & I didn't have a ride. So, I go to my 2nd hour, & the teachers say go back to 1st hour... All the way to portable 22! As soon as I get there, the principal gets on the intercom & says....OK, you can go to your 2nd hour. I was like DAMN! I spent all my time to get there, now I gotta go back. But, I came back to a welcome surprise.... What I hadn't known, was that all these kids weren't just leaving from where I was, this was a phenomenon going all around the school. So, in my 2nd hour there were about 7 people. We sat around & watched a pirated version of The Matrix on the computer... SO, that was cool. Then, I went to my 3rd hour where we did nothing but watch Scream 2. That was cool also. Then I went to lunch where thank god I had One friend. That was fun.. I go to my 4th hour-Biology. I was the first person there, & only 3 other people came in. There were 4 kids in my class. It as amazing... Then at the end I finally found out what happened. Earlier in the day, some girl had called in from her house to the school, & made a bomb threat... From her house! How stupid is that.... They caught her right away... What I couldn't believe either was that it was a girl. That shocked me. But, overall, it was a cool day...Hardly did any work, & had fun. I didn't have to walk home either.. I got a ride. I think we should have more bomb threats like this? What do you think? Wednesday night my friend called me, & told me he planned to skip school with my other friend on Thursday to go see Star Wars, but I wasn't sure I could cause my mom never lets me miss school. But, I asked her & to my surprise once again, she let me stay home. But that wasn't even the big question! I stayed home, but the big question was whether or not there would even be Star Wars tickets available.We planned to go at 1:30 pm, also though I didn't even know if I had a ride to the movie theater. But thank god my 23 year old brother's best friend wanted to go see it & he was home. So, he took me there, & we all met up... There were plenty of tickets available, & we grabbed good seats. There were trailers for The Beach w/ Leonardo DiCaprio, Titan AE, Inspector Gadget, The General, & some Tibetan movie. I'm sitting there with everyone, just waiting. Then finally it came one with the scroll, & the film was awesome.... It's visual effects were awesome. The best I have ever seen in a film. So realistic, & lifelike. I liked the story, & the film was very exciting. I'm not asking you, I'm not telling you, I'm just saying... YOU WILL SEE EPISODE I THIS WEEKEND. There is no doubt about it. You will. That's it. Spielberg will be profiled next Tuesday on CNN's NewsStand series PEOPLE PROFILES. It airs at 8 p.m. ET and 5 p.m. PT, with a repeat at 1 a.m. ET and 10 p.m. PT. It's a one hour, in-depth profile including interviews with Spielberg himself, his parents, Arnold Spielberg and Leah Adler, Richard Dreyfuss and Jeffrey Katzenberg. "My mom and my dad gave me a free reign at expressing myself, up to and including torturing all of my sisters, you know, to the point that I did getin trouble for that. But...I was just trying to find something to do with myself. I didn't quite know how to express it. And I used to express it by telling scary stories to my younger sisters. And they were my first audience." "The movie camera gave me kind of a tool that I could start to, you know, apply some of this more sadistic behavior into something that was a little bit more entertaining." "He cut off the doll's head of Nancy's and served it to her one night. On a platter, this doll's head on a bed of lettuce. In an array of sliced tomatoes and here's...Chatty Kathy. "You'd hear all over the island [Chappaquidick] 'The shark is not working, the shark is not working!' and one day 'The shark is working! The boat is sinking!' We started sinking off the coast. Robert Shaw, Roy Scheider, myself. But that's, the shark worked that day!" "My first serious film was E.T., easy to say it's a kid's confection, but for me it was my first serious film." "Schindler's List changed my life completely, my professional life completely, and certainly in many regards altered me completely because, you know, it made me belive in something that wasn't a guess about outer space or wasn't about where most of my films have come from, which is my imagination." "I think the most important thing that I've gotten from, you know, from the attention to my films and I guess to myself, through my films, is the fact that my kids respect me. And they're proud of me. And they talk to me about it. And they include me in their lives." OK.... That's it for This weeks news, if anything exciting happens again, I'll be sure to let you know. I not only use this site as an outlet for Spielberg & movie news, but also any interesting stories that may have happened to me like this week. I like to get things off my chest. It's been REAL. ADIOS. 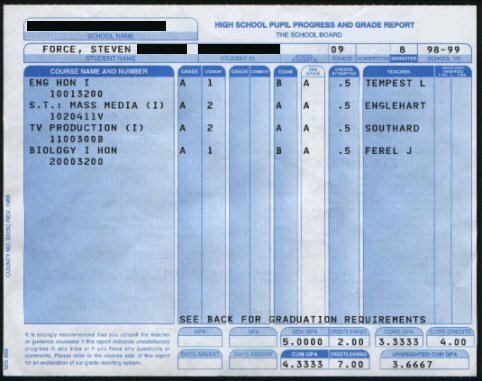 Well folks, Good ol' Steve is back from his little crusade of straight A's in school. Here is a scan. (It was my birthday recently & lucky for you I got a scanner.) Click to make BIGGER. Dark Horizons received a review for the script Minority Report--- Spielberg's next movie with Tom Cruise coming out June 30th, 2000. If you want to read it click here..... Warning though..... It contains SPOILERS. I haven't even read it because I don't like movies to be spoiled, therefore if you do want to be spoiled click here> Script Review: "Minority Report" It's also very negative I hear. But dont panic. SPR was also received as not that good of a script until Spielberg did some thinkering that made it the masterpiece it is. I'm sure Spielberg will do the same with Minority Report. This should teach Steven Spielberg to stick Julia Roberts in the world's single-most horrific wig ever. In the new issue of Vanity Fair, Roberts deems Spielberg a "turncoat" for implicitly confirming the rumors that she was difficult to work with on the set of 1991's Hook, in which Roberts  wearing a wig best described as straw  played Tinkerbell to Robin Williams' Peter Pan. She remembers watching Spielberg say, "It was an unfortunate time for us to work together," during an interview on 60 Minutes. "I saw that and my eyes popped out of my head," Roberts says. "I couldn't believe that this person that I knew and trusted was actually hesitating to come to my defense. It was the first time that I felt I had a turncoat in my midst." Spielberg's representative Marvin Levy stands by the director's comment. "It was just a tough time in her life," he says, mentioning that Hook coincided with Roberts' breakup with fiancé Kiefer Sutherland. "Fortunately, she went on to great success, and so did Steven." Roberts also discussed her role in the new Notting Hill, in which she plays a famous actress who falls in love with an average Joe, personified by the not-so-average Hugh Grant. "I was struggling with playing a person who really only shares an occupation and a height and a weight and a status with me," she says. Oh, is that all? All in all, Roberts is quite content with her fame. "I live a privileged life  hugely privileged. It would be absurd to pretend that it's anything different." How privileged is "hugely"? Well, the June issue of Premiere had Julia as No. 33 on the magazine's "Power List." At $20 million-per-picture, Roberts was in front of fellow film actresses Jodie Foster (No. 43), Meg Ryan (56), Sandra Bullock (76), Gwyneth Paltrow (86  see, Gwynnie, it takes more than just an Oscar), and Cameron Diaz (87). Roberts is also worth every penny, able to attract viewers in theaters and living rooms alike. Case in point: Her recent guest appearance on boyfriend Benjamin Bratt's television drama Law & Order earned the show its highest ratings of the season and helped NBC win May 5's battle of the networks, according to The Hollywood Reporter. Raved Entertainment Weekly of Roberts' performance as a scheming corporate seductress: "Playing a highly competent and put-together operator who turns out to be not a little demented, [Roberts] easily grasped the character, and little by little let a neat and refined facade give way to a kind of dangerous madness." 'Course, Weekly then says that Roberts is at the top of her form 'cause she's happily in love. Sheesh  who over there has been listening to Celine Dion's "Because You Loved Me" a little too often? So, I know what you're thinking... She's a Bi***!! How can she go against the master... Frankly I don't care. There were problems on the set, but... Oh, well. I still like her as an actress. She's pretty cool. So, don't go on hating her.k? That's pretty much it folks!! So, I'm sorry. I'll try to get some more info, but it's a dry period. It's gonna be summer soon, & the focus is on that. Spielberg is taking a little rest right now, & he'll be on track shooting Minority Report this November. So, sit tight. Also, I'll be in Michigan for the summer, and I don't think I'll have access to a computer which means no access to this site, which means no update... You might have to wait till Late August after June.....SORRY>>>>>>>ADIOS. Last Sunday, I went & saw a film that gave me the best movie expierience of 1999... That FILM was a motion picture titled... . I loved this movie so much.... It's awesome!! I can't explain the high I felt after seeing this... I was gushing in excitement. The film rules!! Keanu Reeves as NEO is awesome. That one girl as Trinity (I love that name) is awesome.... And Laurence Fishburne as Morpheus is cool as well... Gotta love it. It is truely the best film so far of 1999. I'd give a review.... An over view of the film or whatever but... Unfortunately, nobody can be told what the Matrix is...You'll have to see it for your self. Remember... No matter what you hear.... Human Beings are not a disease. In other news (There is no Spielberg news), James Cameron is dropping making his beloved Spider-Man movie.. For what reason?? I Don't know, & I could care less. There are no real good movies coming out til may 19th, so we'll just have to sit tight. In case you were wondering what movie comes out May 19th... You'd have to have been in the matrix. Star Wars: The Phantom Menace opens.... Exciting huh?....eh....yeah. Anyway, See the Matrix... Sit tight....& live life.....Happy Trails. First off, Please e-mail me at steveskg@hotmail.com about the Monopoly Game from McDonalds that I wrote about on the Contents Page.... We can win!! The script wasn't supposed to be this way. 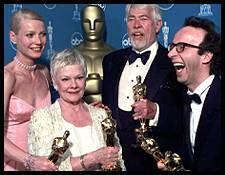 On Oscar night the DreamWorks team of David Geffen, Jeffrey Katzenberg, & Steven Spielberg was hoping-probably expecting- to hear Spielberg's film, Saving Private Ryan, named Best Picture. Certainly, the glittering assemblage at the Dorothy Chandler Pavilion was shocked. When Shakespeare in Love was announced, there was an audible gasp. 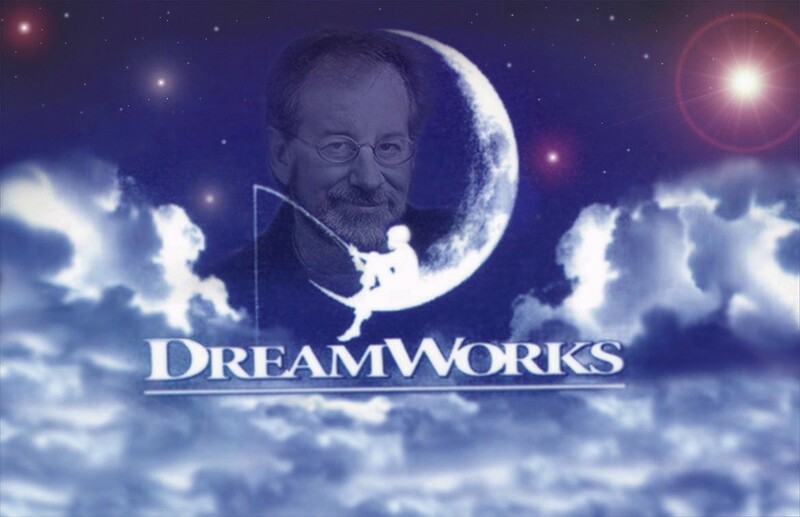 Which makes it a bit more awkward for DreamWorks to spin the news that Spielberg, & his 2 executives, the married couple of Walter Parkes & Laurie Mac Donald, are balking at taking on the expanded film production that DreamWorks feels it's Live-Action Studio needs in order to thrive. DreamWorks which released six films in 1998, wants at least double that output. But Spielberg & his partners will restrict themselves to overseeing no more than have a dozen films a year. Spielberg also will revive his previously dormant production company banner, Amblin, for some films. His financial stake in DreamWorks apparently remains unchanged. This change was planned before the Oscar disappointment, but certainly DreamWorks would have preferred to make the announcement while flush with triumph. Parkes, however, insists DreamWorks is triumphant enough after a strong year at the box-office, with hits including Deep Impact, and Saving Private Ryan. The company also scored nicely with Antz, it's first animated film. And though Katzenberg did not have the giant smash he yearned for with the Prince of Egypt, the picture will gross $100 million in the U.S.
DreamWorks principals say they need to increase production to compete with other studios, which typically release 15 to 20 films a year. They can either make more deals with outside producers or, more likely, hire a high-powered executive to run the live-action division alongside Spielberg's operation. An open question is how involved Katzenberg-who spent 10 years as head of the Disney studio but fared poorly in live-action-will be in building slate. Until now, the area had primarily been Spielberg's domain, while Katzenberg focused on animation and television. There are reports inside and outside the company that the 4 year old DreamWorks in the midst of a broader re-evaluation of it's future and that bigger changes may be afoot. Many industry professionals have long assumed that eventually DreamWorks would combine with Universal- a studio that has been engulfed in management turmoil. The combination might make sense: DreamWorks' animation department could make a nice fit with Universal's theme park operations. Another rumor has Sony as a potential DreamWorks partner. Certainly Sony chief John Calley and Spielberg have bonded personally: Calley is advising the director as he mulls over buying a yacht. But as Calley says no corporate conversations are under way. Geffen says DreamWorks has many suitors, but he maintains that "no merger conversations are going on." For now, he says, the only issue is that "we needed to ramp up production beyond 6 films a year." Most major studios have hundreds of scripts in development t any time, Geffen points out, but DreamWorks is so new that it doesn't have that kind of inventory. The company also lacks a movie-and-TV library that could throw off cash. And with so few releases a year, it's tough to build distribution muscle with theaters. The broader question is whether Dreamworks is a dream that can work. The company has met with mixed results since it's splashy launch. It has performed strongly in film, but most of it's hits (Including Deep Impact and Saving Private Ryan) have been joint ventures with other studios, which came up with the scripts. In television, DreamWorks has had some expensive failures (Ted Danson's Ink, for example) and only one solid hit: Spin City. In music, it has yet to strike gold, George Michael's DreamWorks debut was a disappointment. Newer acts on the label such as Eels, Rufus Wainright & Elliot Smith, have received strong reviews and, so far, have been non-starters on the Billboard charts. Geffen says financial success in music will follow the critics' cheers. "That's how you begin an artist's career," he says. Still, anyone with a pencil & a napkin can calculate that a lot more money has poured out of DreamWorks than has flowed in. It's what you'd expect with a start-up, but as long as that's so, speculation will continue as to whether the company can exist in it's present configuration. An insider at DreamWorks says change seems to be in the air. "At this point, the shoe hasn't dropped," the executive says, "but there is a shoe." That's it for now!! I'm gonna go see The Matrix sometime soon..... You should too..... It looks really cool. ADIOS. Last night, the first words that came to my mind were... TRAVESTY... ROBBED...B**TCH!!!!!! Well, it's been almost a month & a half since I have updated this site. Yet, I have been fathomed by the amount of visitors I have gotten for a site that hasn't updated since last year, technically. So, I must thank you for the continues support, & your e-mails telling me what you think of the site.... HAPPY SUPER BOWL SUNDAY!! By the way Happy New Year, too. Now, here is some info on Indy 4, or what was thought to be Indiana Jones & the Sword of Authur, but as it turns out, Cinescape has proven it to be a hoax as again. So, forget that idea. If you want anymore info on that, check out Harry's Aint-It-Cool-News site. They are sure to have something there on it. The 56th Annual Golden Globe Awards were held last Sunday, & Spielberg's Saving Private Ryan nabbed 2 out of it's 5 nominations. It of course won for Best Director for Mr. Steven Spielberg., & also of course won for Best Motion Picture-Drama going to Saving Private Ryan, which Spielberg also won for producing it. One miniature surprise I found, that I wasn't too happy about was, that the Truman Show's Jim Carrey beat out SPR's Tom Hanks for top acting honors... I thought that sucked. It also lost Best Score to The Truman Show, & Best Screenplay to Shakespeare in Love. But, at least we got in my opinion the top 2 awards of Director & Film. Spielberg was also recently nominated for Best Director by the DGA or Directors Guild of America. To end it all, I would just like to say the Academy Award Nominations will be out February 9th at 8:30 A.M.-Eastern Time, I stress Eastern time. If you're in the Pacific, of course deduct 3 hours, & that would be 5:30 A.M.-Pacific Time, or whatever the time difference is. It should be broadcast on E!, so check your local listings. By the way, I saw A Civil Action, & At First Sight. I know this has nothing to do with Spielberg. However, I would just like to say that At First Sight was OK. It felt a little contrived, & the directing not very original. It followed all the usual cliches this type of movie entails... Not worth the ticket, but maybe worth the rental. 2 stars. A Civil Action, was much classier than At First Sight. It began extremely well, it was told extremely well, but I'm afraid even though it was a true story, the climax just didn't do it for me. It was an anti-climax. You feel, you're set up for an amazing court room ending, but you're left hanging. Almost like, the feeling you had at the end of the Truman Show, how it just ended like that. It didn't feel over. That's my one complaint. So, I give it 3 stars out of 4. Maybe, 3 1/2. That's it for now, so if you really want this thing to be updated soon... Please, e-mail me with your support, it's what keeps me going. So, I would just like to thank you for reading all this, & I'll see ya... ADIOS. Today, we celebrate one of the most important events in the history of cinema... The birth of Steven Spielberg in Cincinnati, Ohio on December 18th, 1946. The worlds most famous director has directed the hits such as Jaws, Close Encounters of the Third Kind, Raiders of the Lost Ark, & the rest of the Indy films. Also, he has directed ET, The Color Purple, Jurassic Park, it's sequel, & one of the 100 greatest films of all time... Schindler's List.... His latest film Saving Private Ryan is being held in the same contention, & just got nominated for 5 Golden Globe Awards including Best Drama, Best Director (Spielberg), & Best Actor in a drama (Tom Hanks). Sorry folks for the mistake on Deep Impact. It is not out for sale, just for rental. However, it will be out on DVD by Christmas (More accurately, December 15th). The Lost World with new added scenes was shown last Sunday, & it won the night with 17 million viewers. I will update some more soon, but I don't really feel like typing. So wait a little while longer. By the way, while in Australia, George Lucas said the Indy 4 script is done. Also, when asked who will direct the 2nd & 3rd prequels, he replied "probable me", so any hopes of Spielberg directing episode 2 is not likely for now. Who knows what will happen. Have fun. 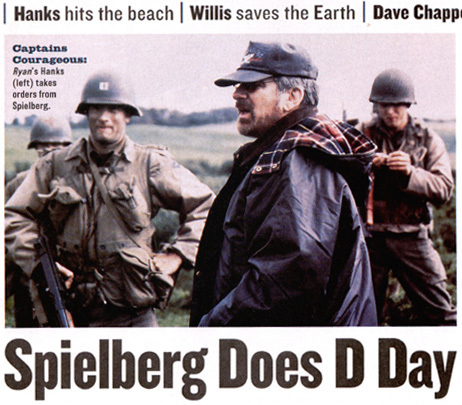 Since I haven't updated in a while, here is some Spielberg news. Deep Impact is out for sale on October 27, & Amistad comes out November 10th. I'm buying both as soon as they come out. Both are awesome. Spielberg is re-teaming with Back to the Future, Forrest Gump, & Contact director Robert Zemeckis for a new movie with Harrison Ford. The film is called "What Lies Beneath" The film will be a joint venture between DreamWorks & Paramount once again. This tidbit came from Variety. There is also info for the new Zemeckis & Hanks film... "The Castaway"
starrer 'What Lies Beneath.' Both films are to be helmed by Robert Zemeckis, and produced by Image Movers, Zemeckis production partnership with Jack Rapke and Steve Starkey. Hanks may also serve as a producer on Castaway,' although that is not clear at this time. The studios will evenly split production costs as well as the overall, worldwide box office pot for both films. 'Maggie Cheung' is set to play the mentor of Nitta Sayuri (Geisha). In the works is a Twister sequel. Hollywood reports say that a sequel is be made in mind for the hugely successful film. The script calls for the original actors to reprise their roles. It's a script based on Micharl Chricton's work. were brought back to life on the screen. Well, here is the BIG update I was talking about. I'll start off by saying... Saving Private Ryan is doing phoenomenal. For 4 straight weeks, it has been #1 at the box-office. It's first weekend it pulled in an estimated $30.6 million,, 2nd weekend it earned $23.3 million, It's 3rd weekend, it got $17.6 million, & in the 4th week it beat out How Stella Got Her Groove Back with $12.9 million. It's 5th week it pulled in a strong $10.9 million falling 2nd only to the Wesley Snipe's Blade, which earned about $17 million. Saving Private Ryan has gotten tons of reviews, 90% of which are extremely positive. Siskel & Ebert give it "2 Big Thumbs up! Way up! ", Entertainment Weekly calls it "a masterpiece. A movie of Staggering Virtuosity, & Raw Lyric Power." However, none of these reviews will ever be able to capture the raw emotions that pour out of the people's eyes when they walk out of the movie theater. Steven Spielberg has been busy as hell these past 2 years. He has been Directing & Producing a total of 4 films. First off, he returned from a 3 year absence of Directing with The Lost World: Jurassic Park, then going on to Produce & Direct the slave ship epic Amistad. Now, he has Exec. Produced another dramatic action movie called Deep Impact directed by The Peacemaker's Mimi Leder. It's about the US & the rest of the world finding out that a meteor is about to strike Earth, and something needs to be done. It's classic Spielberg, and doesn't deserve to be missed. 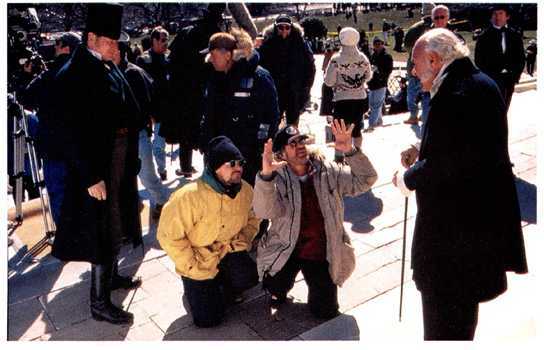 The film stars Morgan Freeman as President of the United States, an Elijah Wood as a concerned bystander. It's called Deep Impact and it comes out May 8th!! However, Spielberg is back on track directing. Coming out this summer is Saving Private Ryan. It's a World War II epic starring Tom Hanks, and Matt Damon about an a nation who has lost 3 of a mothers 4 sons in the war. The mother who is about to receive 3 different telegrams telling her her sons are dead, has one more son still in the war.... Private Ryan. The army, who doesn't want her to lose all her sons, sends out Tom Hanks on a mission to find this Private Ryan. Hence the title, Saving Private Ryan. It should be compelling and heartbreaking. It comes out July 24th! !Go see it! !